معصوم پورسماکوش, جعفر, میری, مرتضی, پورکمر, فاطمه. (1396). ارزیابی داده‌های مدل‌های اقلیمی CMIP5 در مقابل داده‌های مشاهده‌ای ایران. مجله ژئوفیزیک ایران, 11(4), 40-53. جعفر معصوم پورسماکوش; مرتضی میری; فاطمه پورکمر. "ارزیابی داده‌های مدل‌های اقلیمی CMIP5 در مقابل داده‌های مشاهده‌ای ایران". 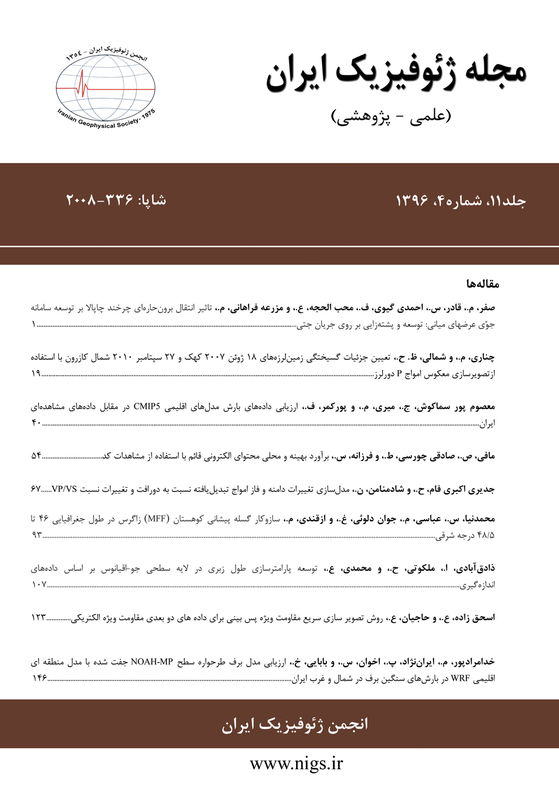 مجله ژئوفیزیک ایران, 11, 4, 1396, 40-53. معصوم پورسماکوش, جعفر, میری, مرتضی, پورکمر, فاطمه. (1396). 'ارزیابی داده‌های مدل‌های اقلیمی CMIP5 در مقابل داده‌های مشاهده‌ای ایران', مجله ژئوفیزیک ایران, 11(4), pp. 40-53. معصوم پورسماکوش, جعفر, میری, مرتضی, پورکمر, فاطمه. ارزیابی داده‌های مدل‌های اقلیمی CMIP5 در مقابل داده‌های مشاهده‌ای ایران. مجله ژئوفیزیک ایران, 1396; 11(4): 40-53. با توجه به تغییرات اقلیمی رخ‌داده آگاهی از مقدار و شدت بارش در شرایط حال حاضر و آینده به‌ویژه در مناطق خشک و نیمه‌خشک مانند ایران که همواره از کمبود آب رنج می‌برد، بسیار ضروری است. ازاین‌رو پژوهش پیش رو با هدف ارزیابی دقت داده‌های بارش مجموع مدل‌های CMIP5 طی دوره پایه (2005-1985) و همچنین داده‌های پیش‌بینی‌شده برای آینده ایران (2050-2005) تدوین ‌شده است. در این راستا داده‌های بارش 8 مدل (BCC-CSM1.1، CCSM4، CESM1-BGC، CESM1-CAM5، CMCC-CM، EC-EARTH، MIROC5 و MIR- CGCM3) با استفاده از آماره‌های نظیرRMSE, BIAS, EF و... بررسی شدند. نتایج حاصل از ارزیابی دقت 8 مدل مورد مطالعه نشان داد که مدل‌های بررسی‌ شده از توانایی بالایی در برآورد بارش کشور برخوردار نیستند و با توجه به نتایج آماره‌هایی نظیر ضریب همبستگی (r) و شیب خط (slope) از دقت متوسط تا ضعیفی برخوردارند. با وجود این مدل‌های BCC-CSM1.1 و CCSM4 نسبت به سایر مدل‌ها در پهنه ایران از دقت بالاتری برخوردار هستند. بر اساس نتایج شاخص‌هایی که میزان توافق سری‌های زمانی و اختلافات مدل‌ها را ارزیابی می‌نمایند، می‌توان گفت که گرچه مدل‌های مورد استفاده در محاسبه مقدار بارش کشور با دقت مناسب، توانایی بالایی ندارند اما به‌خوبی دوره‌های زمانی بارش را برآورد و توانایی مناسبی در تشخیص افت‌وخیزها و روندهای بارش در اکثر نقاط کشور را دارند. نتایج صحت‌سنجی بارش آینده دو مدل منتخب نیز همسو با نتایج ارزیابی داده‌های مدل می‌باشد. در مجموع صحت پیش‌بینی‌ها در نیمه شمالی (به‌جز سواحل خزر) بیش از نیمه جنوبی است. نتایج حاصل از روند بارش مدل CCSM4 تحت دو سناریو 4.5 و 8.5 نشان داد که روند تغییرات بارش آتی کشور برای هیچ منطقه‌ای معنادار نخواهد بود و شیب روند در حد ضعیف تا متوسط است. بر اساس هر دو سناریو روند بارش در جنوب شرق، شمال شرق، گوشه شمال غرب و شرق خزر منفی و در نواحی مرکزی و برخی استان‌های غربی (همدان، مرکزی و چهارمحال و بختیاری) مثبت خواهد بود. The changes in precipitation that depend on future climatic changes highly affect environmental processes and the use of ecosystem services, especially water sources. Because providing necessary material for human beings is mostly dependent on water sources, the reliable prediction of precipitation and water sources, affected by climate change, is of considerable importance. Nowadays, there are centers and various models worldwide that simulate the state of future climate of the earth by different scenarios, e.g., the scenario of release physical and computational structure. Simulations of world climate models have been archived by CMIP project, which are regarded as one of the most important sources to study the climate condition of the 21st century. The simulations from models of general atmospheric circulation, which is a part of CMIP5, are as the basis for the conclusions of international committee related to future climatic changes. The data can be used to assess future climatic changes in local or regional scales, whether directly or after presenting downscale. Although the predictions of general circulation models are reliable enough, ignoring some important features of each region, especially developing countries and the ones with high environmental diversity like Iran, make the data of these models need accurate assessment in various spatial and temporal scales. Therefore, the present study aims to assess the accuracy of precipitation data from eight models (BCC-CSM1.1, CCSM4, CESM1-BGC, CESM1-CAM5, CMCC-CM, EC-EARTH, MIROC5and MIR- CGCM3) of general atmosphere circulation according to high spatial accuracy for Iran applying statistical tests. Statistic indices like R, R^2, RMSE, BIAS, EF, NARMSE, SLOPE, and IA were applied to choose the most appropriate model, out of eight, up close to real data of the country. The findings reveal that Although the models used to calculate rainfall has not high reliability, but also it is too weak to estimate the stations’ extreme events. Besides, in a similar study, Hidalgo and Alfaro (2014) believe that most of the CMIP5 models have low ability to estimate the precipitation of central regions of the USA. Regionally, output accuracy for north-eastern and western regions is more than other parts of the country. Besides, the accuracy for coastal regions of Iran (Oman and Caspian) is very low and practically useless, which is due to the special geographical condition and the contrast of land and water in these regions. In fact, the assessment of future precipitation output of these models under scenario 4.5 and 8.5 presents the same findings; the correctness of predictions in northern half (except for Caspian beaches) is more than the southern half. Scenario 4.5 shows better results in northeast and west while scenario 8.5 shows better results in southern beaches, especially southeast of the country. The findings from the process of precipitation from CCSM4 model, under scenarios 4.5 and 8.5, show that the process of future precipitation changes will not be significant for any region and the slope is from weak to average. دارند، م.، ظرافتی، ه.، کفایت مطلق، ا.م، و سمندر، ر.، 1393، مقایسه بین پایگاه‌های داده جهانی و منطقه‌ای بارش با پایگاه بارش اسفزاری و ایستگاهی ایران زمین: تحقیقات جغرافیایی، 30 (2)، 84-65. عزیزی، ق.، صفرراد، ط.، محمدی، ح.، و فرجی سبکبار، ح.، 1395، ارزیابی و مقایسه داده‌های بازکاوی‌ شده بارش جهت استفاده در ایران: پژوهش‌های جغرافیای طبیعی، 48(1)، 33-49. قهرمان، ن.، بابائیان، ا.، و طباطبایی، س. م.، 1395، ارزیابی پس پردازش بروندادهای دینامیکی مدل‌های اقلیمی در برآورد تغییرات تبخیر تعرق پتانسیل تحت سناریوهای واداشت تابشی (بررسی موردی: دشت مشهد): فیزیک زمین و فضا، 42(3)، 687-696. مسعودیان، س. ا.، 1391، آب‌وهوای ایران: چاپ دوم، انتشارات دانشگاه اصفهان. میری، م.، 1395، واکاوی ارتباط تغییر اقلیم و زوال جنگل‌های زاگرس مطالعه موردی، منطقه‌ی‌ ایلام: رساله دکتری، دانشگاه تهران، دانشکده جغرافیا. میری، م.، رضیئی، ط.، رحیمی، م.، 1395، ارزیابی و مقایسه آماری داده‌های بارش TRMM و GPCC با داده‌های مشاهده‌ای در ایران: فیزیک زمین و فضا، 42(3) ، 657-672. Barker, N. C., and Huang, H. P., 2014, A Comparative Study of Precipitation and Evaporation between CMIP3 and CMIP5 Climate Model Ensembles in Semiarid Regions: Journal of Climate, 27, 3731-3749. Blazquez, J., and Nunez, M. N., 2013, Analysis of uncertainties in future climate projections for South America, comparison of WCRP-CMIP3 and WCRP-CMIP5 models: Climate Dynamics, 41, 1039–1056. Chen, H., and Sun, J., 2013, Projected change in East Asian summer monsoon precipitation under RCP scenario. Springer-Verlag Wien: Meteorology and Atmospheric Physics, 121, 55–77. Chen, L., and Frauenfeld, O. W., 2014, A comprehensive evaluation of precipitation simulations over China based on CMIP5 multimodel ensemble projections: Journal of Geophysical Research:Atmospheres, 119 (10), 5767-5786. Haile, A. T., and Rientjes, T., 2015, Evaluation of regional climate model simulations of rainfall over the Upper Blue Nile basin: Atmospheric Research, 161-162, 57-64. Hidalgo, H. G., and Alfaro, E. J., 2014, Skill of CMIP5 climate models in reproducing 20th century basic climate features in central america: International Journal of Climatology, 35, 3327-3421. Hurrell, J. W., Holland, M. M., Gent, P. R., Ghan, S., Kay, J. E., Kushner, P. J., Lamarque, J. F., Large, W. G., Lawrence, D., Lindsay, K., Lipscomb, W. H., Long, M. C, Mahowald, N., Marsh, D. R., Neale, R. B., Rasch, P., Vavrus, S., Vertenstein, M., Bader, D., Collins, W. D., Hack, J. J., Kiehl, J., and Marshall., S., 2113, The community earth system model: a framework for collaborative research: Bulletin of the American Meteorological Society, 24,1332–1361. IPCC., 2007, Climate Change 2007, The Physical Science Basis, Contribution of the Working Group to the Fourth Assessment Report of the Intergovernmental Panel on Climate Change, edited by S. Solomon et al.,: Cambridge Univ. Press, Cambridge, U. K. 996 p. IPCC., 2013, Climate Change 2013: The Physical Science Basis. Contribution of Working Group I to the Fifth Assessment Report of the Intergovern-mental Panel on Climate Change [Stocker, T. F., Qin, D., Plattner, G. K., Tignor, M., Allen, S. K. , Boschung, J., Nauels, A., Xia, Y., Bex, V., and Midgley, P. M., (eds.)]. Cambridge University Press, Cambridge, Unitesd Kingdom and New York, NY, USA, 1535 pp. Jiang, M., Felzer, B.S., and Sahagian, D., 2016, Predictability of Precipitation over the Conterminous U.S. Based on the CMIP5 Multi-Model Ensemble: Scientific Reports, doi: 10.1038/srep29962. Koutroulis, A. G., Grillakis, M. G., Tsanis, I. K., and Papadimitriou, L., 2015, Evaluation of precipitation and temperature simulation performance of the CMIP3 and CMIP5 historical experiments: Climate Dynamic, 47(5–6), 1881–1898. Lee, J. Y., and Wang, B., 2014, Future change of global monsoons in the CMIP5: Climate Dynamic, 42, 101-11. McSweeney, C. F., Jones, R. G., Lee, R. W., and Rowell, D. P., 2015, Selecting CMIP5 GCMs for downscaling over multiple regions: Climate Dynamics, 44(11), 3237–3261. Moise, A., Wilson, L., Grose, M., Whetton, P., Watterson, I., Bhend, J., Bathols, J., Hanson, L., Erwin, T., Bedin, T., Heady, C., and Rafter, T., 2015, Evaluation of CMIP3 and CMIP5 Models over the Australian Region to Inform Confidence in Projections: Australian Meteorological and Oceanographic Journal, 65(1), 12–53. Roshan, Gh. R., and Grab, S. W., 2012, Regional Climate Change Scenarios and Their Impacts on Water Requirements for Wheat Production in Iran: International Journal of Plant Production, 2, 239-265. Wang, L., and Chen, W., 2013, A CMIP5 multimodel projection of future temperature, Precipitation,and climatological drought in China: International Journal of Climatology, 34, 2059- 2078. Watanabe, M., Suzuki, T., Oishi, R., Komuro, Y., Watanabe, S., Emori, S., Takemura, T., Chikira, M., Ogura, T., Sekiguchi, M., Takata, K., Yamazaki, D., Yokohata, T., Nozawa, T., Hasumi, H., Tatebe, H., and Kimoto, M., 2010, Improved climate simulation by MIROC5: mean states, variability, and climate sensitivity: Journal of Climate, 23, 6312–6335. Willmott, C. J., 1984, On the evaluation of model performance in physical geography In Spatial Statistics and Models, 443-460. Wu, T., Li, W., Ji, J., Xin, X., Li, L., Wang, Z., Zhang, Y., Li, J., Zhang, F., Wei, M., Shi, X., Wu, F., Zhang, L., Chu, M., Jie, W., Liu, Y., Wang, F., Liu, X., Li, Q., Dong, M., Liang, X., Gao, Y., and Zhang, J., 2113, Global carbon budgets simulated by the Beijing Climate Center climate system model for the last century: Journal of Geophysical Research Atmospheres, 115, 4326–4347. Xu, Y., and Xu, C. H., 2012, Preliminary Assessment of Simulations of Climate Changes over China by CMIP5 Multi-Models: Atmospheric and Oceanic Science Letters, 5( 6), 489-494. Zhao, L., Xu, J., and Powell, A., 2013, Discrepancies of surface temperature trends in the CMIP5 simulations and observations on the global and regional scales: Clim Past Discuss, 9, 6161–6178.